Applies in minutes and the shine truly lasts! Apply the TUF SHINE Tire Clearcoat on top of it to preserve the new look! Prior to using TUF SHINE Black Restore, the surface MUST be clean and free of ANY silicone residue. Failure to properly clean the surface will result in adhesion failure. It is recommended that the TUF SHINE Tire Cleaner be used as it is specially formulated to remove silicone. TUF SHINE Black Restore is water based and will not stick to silicone. 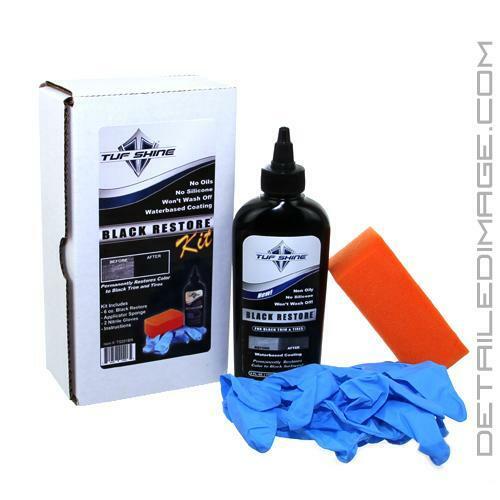 TUF SHINE Black Restore contains no silicone's or solvents. Proper surface preparation is the key to success. 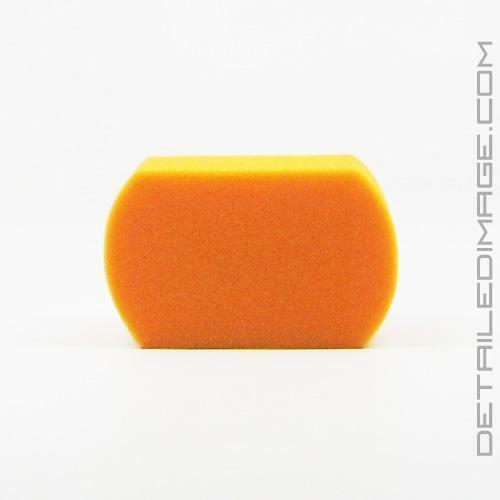 For heavily soiled surfaces, use a stiff bristle brush for a more aggressive scrub. Rinse well and allow time to dry before applying TUF SHINE Black Restore. TUF SHINE Black Restore contains special colorants which are NOT in suspension. Shake the container well and often during use to prevent settling of the colorant. Once the surface is clean, TUF SHINE Black Restore may be applied with a foam paint brush or the supplied TUF SHINE Applicator Sponge (purchased separately). Wear water proof gloves to protect hands from staining. Rinse sponge after use with water for future use. Make sure you don't spill any on the driveway, ground, shelving units, etc. as it stains fast. If you do spill any rinse it immediately with a wet rag. Once dry, apply a minimum of two coats of the TUF SHINE Tire Clearcoat for added shine and UV protection. The finished surface will now withstand repeated pressure washings and retain a clean appearance for an extended period of time. Re-apply as needed for extended protection. CAUTION: Liquid consistency is very thin, and could easily spill. Set opened bottle on waterproof pad to protect floors and driveways. Keep a wet rag handy as spills dry very quickly. For more information, check out the Instructions Sheet below in the Product Downloads section. Think of the product as the wheel shine with a tint of black dye. You can use it on your tires to produce a very matte finish, and if in time you desire a slight more sheen, top it with the clear tire dressing. It worked very well on a black vinyl top that was fading and in need of replacement, this product has extended the life of the top. Will not adhere to waxy looking, highly flexible plastics. Test a small area first. Allow to dry and check adhesion. APPLY TO HOT SURFACES, IN DIRECT SUNLIGHT OR BELOW 50 degrees F.
Important: Surfaces must be thoroughly cleaned with TUF SHINE Trim/Tire Cleaner to remove any wax and silicone or flaking may occur. Worked great on some old black plastic areas on the Ram 1500 bumpers. watch out for how runny it can get, protect areas around where you are working and definitely wear gloves. :) Would buy it again and recommend to friends. Once you're willing to put the effort in re. preparation of the tires and trim, the appearance this product gives is absolutely outstanding. A word or two of caution: set aside a few hours to do this, and have some rags handy. The liquid itself runs easily so take your time to apply it to the applicator or there will be spillage from the foam applicator, and be sure to wear the gloves provided. Once the surface preparation is thorough and completed, actual application of the Restore is simple and straightforward. Again, be careful as the Restore shoe-shine-like liquid runs easily. Let it dry and coat at least twice with TUFSHINE clearcoat. Brilliant finish that will last ONCE YOU'VE CLEANED AND PREPPED THE SURFACE (TIRES AND TRIM) PROPERLY. Seems to work as promised. Seems to have a similar consistancy to black shoe shine in the squeeze bottle. DId restore a nice deep color to my cowl on my F150 but it is tough to get it even. would work better on smooth trim peices and not ones that have alot of grooves, slots, or serrations. A little will go a very long way. Be sure to wear the gloves and rinse the sponge afterwards.